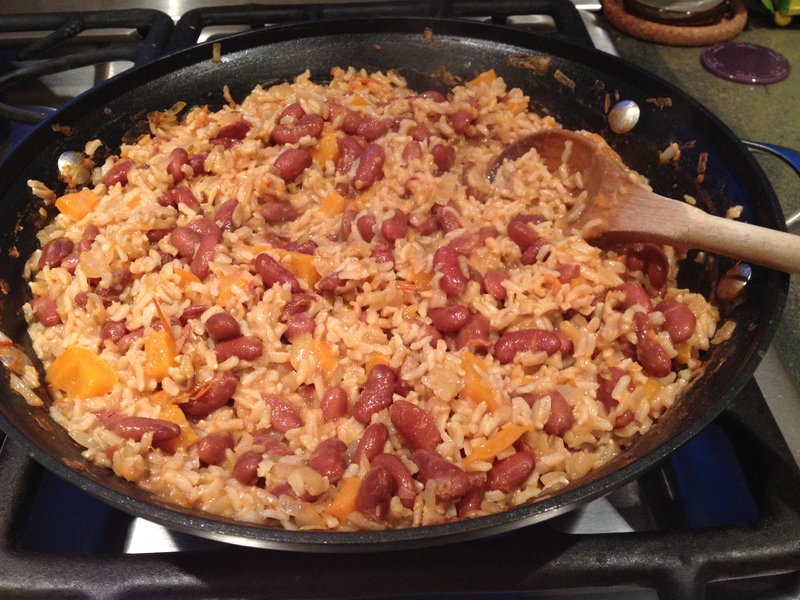 Beans and Rice, or Rice and Beans? Does it matter? The real thing is: this is easy and delicious! My husband and I have been making a real effort to be more active. While I have been and off and on runner for a few years, he has always resisted. Like most people, he had plenty of “reasons” to walk instead of run. But this June, he was challenged to do a 5K. Mind you, the challenge wasn’t to run it. In fact, there was no mention of running. We just wanted him to participate with us. Yet somehow, this fueled his desire NOT to walk it. So, I stepped back from my usual runs to do the C25K program with him. This is a long way of explaining why quick and easy dinners are high priority. When he gets home from work, we go out for our run and come back hungry! This meal went together quickly with a little prep earlier. Heat the oil in a large pan and add the onion, garlic and cumin seeds. When these are translucent, add the pepper, tomato and beans. Cook at a low boil until the liquid is nearly gone. Add the rice, salt and splash with lime juice. I think cilantro would be a nice addition, but I didn’t have any. It’s also Dave Ramsey approved!